From sleek ranges to high-tech faucets, a slew of modern kitchen products will be displayed at Dwell on Design in Los Angeles, June 20-22. Click through the slideshow to preview the array. 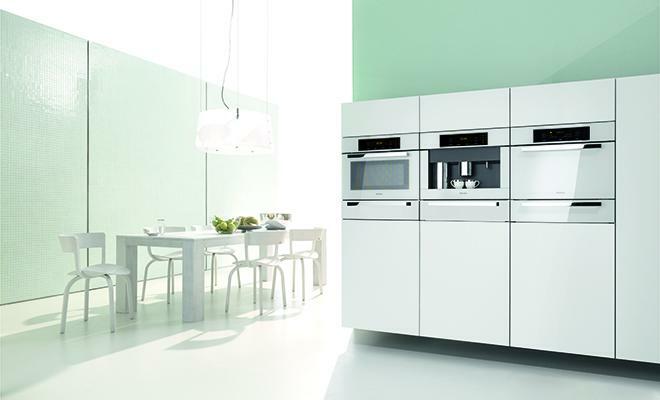 Immer Besser—meaning “Forever Better"—is Miele's motto. The Brilliant White Collection features sleek built-in appliances: convection, steam, and speed ovens, plus a whole bean coffee system and a plate- and cup-warmer. Dacor products suit tech-savvy home cooks. The Discovery Dual Range oven wirelessly connects to a tablet via the brand's iQ app for a customizable kitchen experience. Kohler's simple designs make for a more efficient cooking experience. Case in point? The brand's Sensate touchless faucet that enables easy hand-washing. GE Monogram takes inspiration from aviation and infrastructural industries when designing refrigerators and dishwashers. The envelope-pushing brand will display its latest wares, and industrial design director of GE Appliances Lou Lenzi will join us onstage to talk about kitchen trends and technology. Broan-NuTone will present BEST Sorpresa, a collection of 11 Italian-influenced range hoods in bold shapes and saturated colors.